Dennis Muilenburg speaks during a Wednesday event. The Boeing CEO spoke about the future of space exploration at the 37th annual Patterson Transportation Lecture. 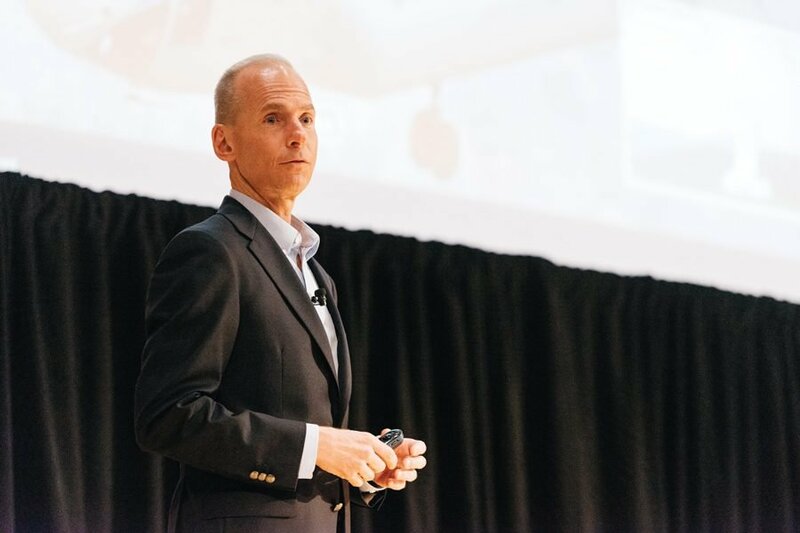 Dennis Muilenburg, chairman, president and CEO of The Boeing Company, told a crowd of students and industry professionals Wednesday that within the next couple of years, Boeing will put the first human on Mars. “The world is on the cusp of a revolution and a transformation into the next age of space exploration,” Muilenburg said. Muilenburg spoke at the 37th annual Patterson Transportation Lecture in Lutkin Hall. The lecture was sponsored by the Northwestern University Transportation Center. Boeing takes pride in its four missions: “connect, protect, explore and inspire the world through space innovation,” Muilenburg said. The company is the main contractor of NASA’s Space Launch System — a 384-feet-tall rocket that has 9.2 million pounds of thrust, which is roughly equal to 208,000 Corvette engines, Muilenburg said. He said although it is still in its beginning stages, the Space Launch System will be the first spaceship to put humans on Mars. Muilenburg added that this will be the first deep-space rocket launch in the past 50 years. The Space Launch System’s first launch test will take place in about a year and a half, he said. “Programs on the way today are bigger and more significant than the Apollo program,” he said. Muilenburg said technologies such as space hotels and smart manufacturing facilities in space that take advantage of low gravity conditions will be available in the near future. Pushing the boundaries of the new frontier of human space exploration has “enormous” benefits in other areas as well, Muilenburg said. He said science in cutting-edge digital devices, advanced materials, sports and fitness and biotechnology all have connections to the ongoing investment in space exploration. Muilenburg added that companies like Boeing have a responsibility to inspire future talent in engineering. He said his two children, who both have interests in engineering, joined him in witnessing several spacial launches at Boeing. Northwestern University Transportation Center director Hani Mahmassani, who introduced Muilenburg, said the center was honored to invite someone with a distinguished career in space science. “Boeing is one of the leading corporations in space exploration, at least in my generation,” Mahmassani said. Ryan Albelda, a McCormick junior who attended the lecture, said while she’s met professors who work in the space industry, it was helpful to hear from CEOs about scientific innovation outside of NU. “Seeing some of these industry professionals and seeing people with jobs I want to work towards is really inspiring,” Albelda said.